As Lizz promised, the potato pizza at Five Points is totally to die for. I could have eaten that pie all day long. 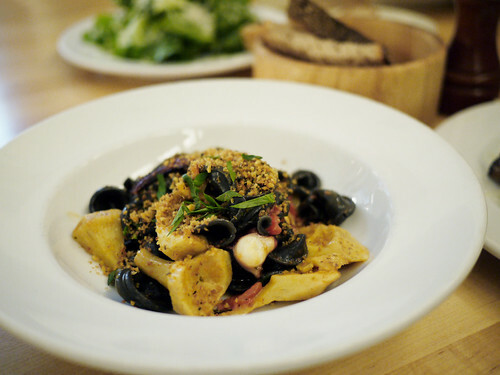 It's a good thing we ordered a couple other dishes to try, namely an escarole salad that easily fed the three of us, along with an enjoyable squid ink torchio pasta dish. It was a damn fine lunch, punctuated with hilarious conversation and a congratulatory round of hoorahs for Lizz, who won this year's Grilled Cheese contest at Artisanal. Got to head up there soon before they stop serving her drunken raclette grilled cheese on the lunch menu.